(Nanowerk News) An international team, including scientists from DESY, has caught a light sensitive biomolecule at work with an X-ray laser. 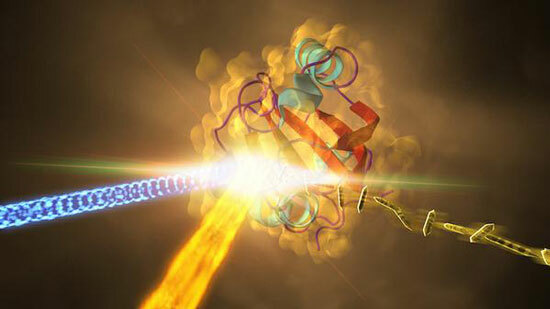 The study proves that X-ray lasers can capture the fast dynamics of biomolecules in ultra slow-motion, as the scientists led by Prof. Marius Schmidt from the University of Wisconsin-Milwaukee write in the journal Science ("Time-resolved serial crystallography captures high-resolution intermediates of photoactive yellow protein"). "Our study paves the way for movies from the nano world with atomic spatial resolution and ultrafast temporal resolution", says Schmidt. The researchers used the photoactive yellow protein (PYP) as a model system. PYP is a receptor for blue light that is part of the photosynthetic machinery in certain bacteria. When it catches a blue photon, it cycles through various intermediate structures as it harvests the energy of the photon, before it returns to its initial state. Most steps of this PYP photocycle have been well studied, making it an excellent candidate for validating a new method. For their ultra-fast snapshots of the PYP dynamics, the scientists first produced tiny crystals of PYP molecules, most measuring less than 0.01 millimetres across. These microcrystals were sprayed into the focus of the world's most powerful X-ray laser, LCLS at the SLAC National Accelerator Laboratory in the US, as their photocycle was kicked off with a meticulously synchronised blue laser pulse. Thanks to the incredibly short and intense X-ray flashes of the LCLS, the researchers could watch how PYP changes its shape at different time steps in the photocycle, by taking snapshot X-ray diffraction patterns. With a resolution of 0.16 nanometres, these are the most detailed images of a biomolecule ever made with an X-ray laser. A nanometre is a millionth of a millimetre. The diameter of the smallest atom, hydrogen, is about 0.1 nanometres. Beyond reproducing known aspects of the PYP photocycle, thereby validating the new method, this investigation revealed much finer details. Also, thanks to the high temporal resolution, the X-ray laser could, in principle, study steps in the cycle that are shorter than 1 picosecond (a picosecond is a trillionth of a second) - too fast to be caught with previous techniques. The ultrafast snapshots can be assembled into a movie, showing the dynamics in ultra slow-motion. "This is a real breakthrough", emphasises co-author Prof. Henry Chapman from the Center for Free-Electron Laser Science at DESY, who is also a member of the Hamburg Centre for Ultrafast Imaging. "Our study is opening the door for time resolved studies of dynamic processes with atomic resolution." Compared to other methods, X-ray lasers, like the LCLS or the European XFEL that is currently being built from the DESY campus in Hamburg to the neighbouring town of Schenefeld, offer several advantages for the investigation of ultrafast dynamics of molecules. They produce the most brilliant X-ray flashes on earth, offering femtosecond time resolution. A femtosecond is a quadrillionth of a second. While 40 femtosecond X-ray flashes were used for this experiment, the pulse duration can be made even shorter down to just a few femtoseconds. "You need a short pulse to resolve the steps of these fast processes", underlines co-author Dr. Anton Barty, also from DESY. "The short flashes also overcome the problem of damaging the often delicate samples with the intense X-rays." Although the powerful pulses usually vaporise the sample, they are so short that they produce a high-quality diffraction signal on the detector before the sample disintegrates. This principle, called diffraction before destruction, was proven a few years ago by an international collaboration led by DESY. X-ray lasers use a fresh sample for every shot, which also avoids radiation damage that can accumulate in the samples in other types of investigations. And X-ray lasers typically investigate very small crystals that often are much easier to fabricate than larger crystals. In fact, some biomolecules are so hard to crystallise that they can only be investigated with an X-ray laser. The small crystal size is also an advantage when it comes to kick-starting molecular dynamics uniformly across the sample. In larger samples, the initiating optical laser pulse is often quickly absorbed in the sample, which excites only a thin layer and leaves the bulk of the crystal unaffected. The PYP microcrystal dimensions were perfectly matched to the optical absorption so that all molecules in the crystal were undergoing the same dynamics, which in turn allowed sensitive measurements of the molecular changes by snapshot X-ray diffraction. Taken together, X-ray laser investigations can offer previously inaccessible new insights into the dynamics of the molecular world, complementing other methods. Using the ultra slow-motion, the scientists next plan to elucidate the fast steps of the PYP photocycle that are too short to be seen with previous methods.